The 20 mm automatic cannon first saw service during World War 1 but achieved its peak of success in World War 2, mainly as an aircraft and short-range anti-aircraft weapon, but also in some light armoured vehicles and small naval craft. Since the 1950s the popularity of this calibre has declined, as it has been replaced in most of its roles either by larger-calibre cannon or by guided missiles. However, 20 mm cannon continue to equip US fighter planes, remain popular for the short-range defence of warships and have found new roles in arming helicopters. 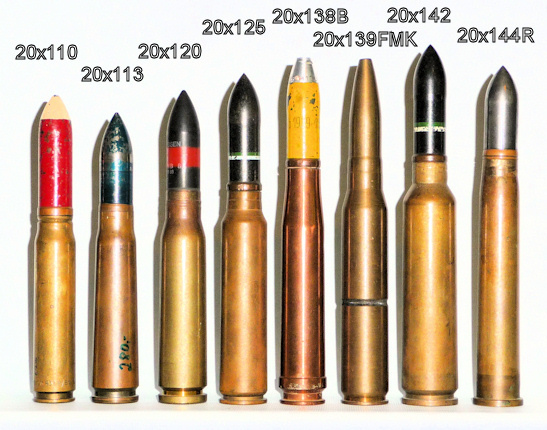 A wide range of different cartridges was developed for 20 mm cannon, varying greatly in size and power. Only one saw service in WW1, but by WW2 some seventeen different rounds were in use; no less than five of them in Japan and four in Germany. Many of these disappeared soon after WW2, and today only four cartridges from that period remain in production. However, another four were introduced in the 1950s and these also remain in service today. This basic guide is concerned only with identifying, and providing some brief historical notes about, those cartridges which have seen service in the armed forces of at least one country. All of them have been made in different loadings – in some cases, in a very wide variety of them – so there is plenty of scope for collectors. There are also some experimental rounds to search for, but these are much less common. When collecting cannon ammunition it is of course necessary to ensure that you comply with the laws of your country. Projectiles containing explosives are banned in almost all circumstances, and there may also be restrictions concerning those with incendiary or tracer elements. The great majority of rounds which become available to collectors have inert projectiles and most also have the propellant removed, but it is advisable to check this. Projectiles are usually very firmly crimped into the cases, so rather than risk damaging the case necks it is common practice to drill a hole in the side of the case to remove the propellant. However, this process carries some risk and safety precautions are required, so do not attempt it unless you know what you are doing. This is the "granddad" of all 20 mm cannon cartridges, being used in the German Becker, developed during WW1. About 360 guns had been delivered by the end of the war, with about a third of them fitted to aircraft and the rest issued to troops for anti-aircraft and anti-tank purposes. As well as the solid AP shot shown, an HE shell with a very prominent plunger-type nose fuze may be found. A very similar cartridge is often confused with the Becker; this is for the German Ehrhardt, which entered production by the end of WW1 but did not make it into service. It has a slightly wider case (see item 494-17). After WW1 the development of the Becker was continued, first by SEMAG of Switzerland and, at the end of the 1920s, by Oerlikon. The cartridge case was slightly enlarged and used in Oerlikon's Type F, or FF, which saw service in various air forces during the 1930s. The gun was most famous for its adoption by the Japanese Navy air force under the designation 20mm Type 99-1. Among other planes, this equipped the initial marks of the Mitsubishi A6M "Zero" fighter. The German Luftwaffe decided in the late 1930s to adopt a light cannon to equip its fighters and selected the Oerlikon FF, which they made under licence as the MG-FF. However, they made some changes to the gun and ammunition, including lengthening the cartridge case. During 1940 they introduced the "Minengeschoss" (mine shell), which was made by drawing the projectile body in the same way as a cartridge case rather than drilling a cavity for explosives. This enabled very thin projectile walls to be made, doubling their HE/I capacity while also reducing their weight. The recoil characteristics were different, causing the gun to be modified and subsequently given the designation "MG-FFM"
The Lufwaffe only adopted the MG-FF as an interim measure while a more effective gun was being developed. This emerged in late 1940 as the Mauser MG 151 in 15x96 calibre. However, the advantages of the high-capacity M-geschoss shell were soon realised, so the cartridge case was necked out and shortened to take the same shells as the MG-FFM. The gun designation was changed to MG 151/20, and this remained the Luftwaffe's standard aircraft cannon from 1941 to the end of WW2. It was also used by France (latterly as a helicopter gun) until at least the 1970s. It was unusual in being offered with two different priming systems: electric (for synchronised guns) and percussion. The yellow with green band colouring on the projectile shown (and that of the 20x80RB) indicate an HE shell with a self-destruct fuze, as typically used for home defence. This cartridge was developed during WW2 for the Japanese Army air force's Ho-5 cannon, also known as the 20mm Type 2. The gun was based on a slightly enlarged Browning M2. As designed, it offered an impressive combination of high performance and light weight, but the lack of high-quality steels for gun-making meant that the ammunition had to be significantly downloaded to reduce the stress on the gun mechanism. Despite this, the Ho-5 was the Army's standard aircraft cannon at the end of WW2. This cartridge was developed in the late 1930s for the Soviet ShVAK aircraft cannon. In fact, the gun was first produced in 12.7x107R calibre, using a rimmed case which was quite different from the later (and still current) 12.7x108. However, that saw very little use, the cartridge soon being necked out to 20 mm calibre. The gun had a good rate of fire, but the performance of the cartridge was not impressive, as the light shells held little HE.As well as being extensively used in Soviet aircraft during WW2, the gun was also fitted to some light tanks. At the end of the war, the Berezin B-20 appeared, a lighter gun chambered for the same cartridge. The cartridge has survived to this day because it is used in sub-calibre training devices. When SEMAG took over the development of the Becker, they also introduced a more powerful version using a longer-cased 20x100RB cartridge. Oerlikon continued its developed as the Type L (later the FFL). This saw very limited use, except for its adoption by the Japanese Navy air force as the Type 99-2, with a fractionally longer cartridge case. This supplemented the smaller Type 99-1, replacing it in service in later marks of the A6M Zero, and was the Navy's standard aircraft cannon at the end of WW2. This Rheinmetall-Borsig development was the successor to the 20x105B, the change apparently being made to improve the reliability of ammunition feeding. It was used in the MG 204 aircraft gun of the late 1930s, which saw only very limited service in some Luftwaffe seaplanes. After Oerlikon took over the development of the SEMAG guns in the late 1920s, they developed an even larger version of the gun around this cartridge. It was known as the Oerlikon Type S (or FFS in its aircraft version) and is probably the mostly widely used 20mm cannon ever made. As an aircraft gun it saw only limited use with the French air force in the 1930s, but it was adopted by the RN and USN and became their standard light AA gun in WW2. It lasted in RN service certainly until the late 1980s if not later, and remains in use around the world to this day. This cartridge was developed in France in the mid-1930s for use in the Hispano-Suiza HS 404 aircraft gun. It is similar to the 20x110RB described above, except that the rim is the same diameter as the body and the shoulder is sharper. The gun was adopted by the RAF as the 20mm Hispano, remaining in service until replaced by the 30mm Aden in the mid-1950s, and was also used by US aircraft in and after WW2. The last version of the USAF's gun, the M24, had electric rather than percussion priming. This gun and the postwar HS 804 have been widely used as aircraft and AA guns, and the ammunition remains in production. The cartridge was also used in the postwar Bofors m/45 and m/49 aircraft guns. The third photo shows a postwar Swiss API round. This rivals the 20x105 as being one of the least-used cannon rounds. It was developed in Finland in the mid-1930s by Aimo Lahti for his L-34 "boat gun"; a light automatic cannon fitted to about a dozen patrol boats. Various experimental versions were developed, and belted cases may also be found. This cartridge was developed in Denmark in the 1920s for the Madsen automatic cannon, offered in various mountings for aircraft, AA and anti-tank use, although only successful in the AA role. It was never the primary armament of any major army, but was widely used in WW2 and remained in service for decades afterwards. The ammunition for the gun was made in several countries, mostly notably in the UK by Kynoch, as was usually the case for Madsen ammunition as they had no ammunition production facilities of their own. This Japanese Army cartridge was first used in the Type 97 anti-tank rifle introduced in the late 1930s, but during WW2 the mechanism of this semi-automatic gun was adapted to create an automatic aircraft cannon. This saw limited use in two versions; the Ho-1 for flexible mountings and the Ho-3 for fixed use. The guns were too slow-firing to be considered successful and were replaced by the Ho-5, which was lighter and had twice the rate of fire. This was the second of the 20mm cannon cartridges developed by Solothurn in the 1930s, and is known as the "Long Solothurn" round. It proved far more successful than the 20x105B, being primarily used in the highly successful FlaK 30 and 38 AA guns which were extensively used by German forces in WW2 (and remained in service in some nations for decades after the war). It was also used in the KwK 30 and 38 light AFV guns, and in the Solothurn S18-1000 series anti-tank rifles. As well as being used in these German and Swiss weapons, it was used in the Finnish Lahti L39 anti-tank rifle and L40 AA gun, and in the Italian Breda M35 and Scotti cannon. A very wide range of ammunition was developed for this gun, including M-geschoss shells and Pzgr 40 tungsten-cored AP. This was developed in Switzerland in the late 1930s for the FMK aircraft gun (which saw limited use) and the Flab Kan 38 AA gun, which remained in use for some time after the war. This cartridge is very similar to the postwar 20x139 cartridge for the Hispano-Suiza Hs 820, but the rim is thinner and the cases of brass. The example shown here is a drill round. This was the ammunition used for the Japanese Army's Type 98, their standard light AA gun from the late 1930s to the end of WW2. This powerful round was also credited with some anti-tank capability and so came with AP as well as HE projectiles. There was an earlier Type 94 AA gun which used even larger (20x158) ammunition, but this saw very little use before being replaced by the Type 98. This was a Bofors development for their m/40 AA and anti-tank gun. It was in effect a scaled-down version of their famous 40 mm, but did not achieve anywhere near the same success and the cartridges are now uncommon. This case is fitted with a non-standard dummy projectile. This American cartridge is probably the most widely used 20mm round in service today, due to the fact that it is chambered in the M61 (Vulcan) "gatling" rotary cannon fitted to US fighters, the naval Phalanx close-in weapon system, and some AA vehicles. It is also chambered in the US M39 revolver cannon (as fitted to many 1950s USAF fighters, and still used in the F-5), the current French GIAT 20M621, and the Czech ZPL-20, a version of the Russian 23mm GSh-23 twin-barrel aircraft gun rechambered for the NATO round. The history of this cartridge goes back to WW2 when a very powerful .60 inch anti-tank rifle was developed. This never saw service but the 15.2x114 ammunition was used in various experimental aircraft guns developed during WW2, notably the T17 which was a modified Mauser MG 151. After the war the .60 cartridge remained the USAAF's preferred basis for new aircraft guns, and the first versions of what became the M39 and the M61 were chambered for it. However, the advantages of explosive shells were finally accepted by the USAF and the case was necked out to 20mm and slightly shortened to keep the overall length the same. Many different loadings in several countries have been developed for this round, including APDS (for the Phalanx). The original USAF ammunition was the M50 series; this was largely replaced by the more streamlined, multi-purpose PGU-28/B from the late 1980s, but the older rounds have been reinstated because of concerns over premature explosions in the barrel. All versions of the 20x102 use electric priming. The USN did not initially share the USAAF/USAF's interest in new revolver and rotary guns. Instead, they improved the performance of the Hispano by speeding up its rate of fire and rechambering it for a powerful new round, the 20x110 USN. This was developed by taking the base dimensions of the 20x102, but stretching the case length to the maximum which the Hispano could handle. It hardly seemed worth the effort as the performance is only marginally better than the 20x102. Like its smaller brother, it uses electric priming. The modified Hispano was designated the Mk 12 and was the USN's standard aircraft cannon from the mid 1950s until the 1970s when it was finally replaced by the M61. As well as the Mk 12, the new round was chambered in a remarkable gun, the Mk 11. This is a twin-barrel eight-chamber revolver with a mixture of recoil and gas operation and with partly smoothbored barrels. It was used only in the Mk 4 gunpod. This round remains in production but is steadily going out of use as the planes which carry the guns are retired, and it is likely to become obsolete soon. This is one of the two European 20mm rounds to have been introduced since WW2. It was developed by Oerlikon in the 1950s for their KAA cannon, intended as a successor to the famous 20mm Type S. The cartridge is far more powerful, and the gun fires twice as fast. It has not matched the level of success of the older Oerlikon, although it has achieved numerous sales, primarily as a naval AA gun. It was rapidly adopted by the RN, after the Falklands War revealed the inadequacy of close-in defence guns, in the GAM-B01 mounting. The cartridge has also been adopted, in electric rather than percussion-primed form, for the unusual Spanish Meroka volley gun, used as a naval close-in weapon system. This is the other postwar European 20mm round, and a close rival for the 20x128. It was originally introduced by Hispano-Suiza in the 1950s for their HS 820 cannon, which they saw as the natural successor to the HS 804. Hispano-Suiza was taken over by Oerlikon in about 1970, after which the HS 820 was renamed the Oerlikon KAD. 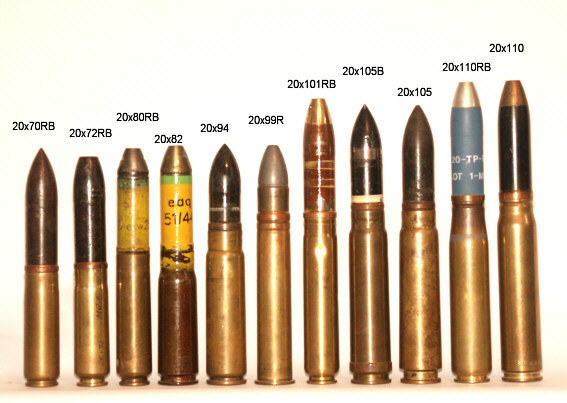 The cartridge has been more successful than the 20x128, mainly because of its use in the popular Rheinmetall Rh 202 cannon. It is also chambered in the GIAT F2 / 20M693, which is made in South Africa as the Vektor G1-2. These guns have seen various uses, as naval and land-based AA, light AFV armament and in helicopters. This little cartridge is in fact a slightly modified version of the 20x82, and is interchangeable with it. It is made in South Africa, where the Mauser MG 151/20 cannon is still in production as the Vektor GA-1. The light weight, small size and low recoil of this gun make it popular for fitting to light vehicles and small helicopters. The cartridge is also chambered in the Mechem NTW-20 anti-materiel rifle. M39, M61 (Vulcan), M197, GIAT M 621, Ford Tigerclaws, (APDS is M149 Phalanx round). Electric primed. HS404/804; AN/M2+M3 (US), m/45+49 (S), M1955 (YU), G 360 (IS), RT20 rifle (Croatia). Mark 11 + Mark 12 aircraft. 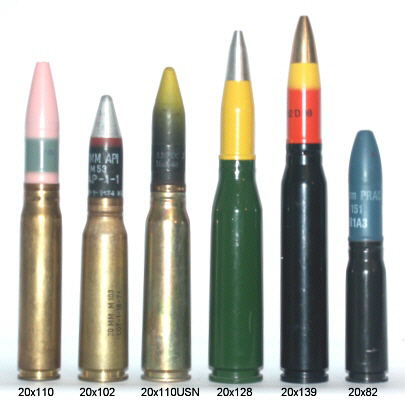 HS 820/Oerlikon KAD (US M139), Rheinmetall Rh 202, GIAT M 693, Mauser MK20, HS 827 exp.